90% off Tarte Collector's Set! Have you ever wondered how to get your favorite department store makeup at drugstore prices? 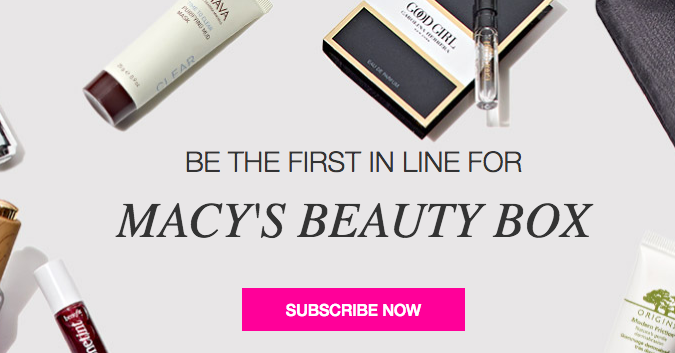 Allow me to introduce you to Macy’s Beauty Box subscription program! Haven’t heard of it? Don’t worry, it’s relatively new and I’m going to walk you through everything you need to know so you can decide if this is the right beauty box for you. What is Macy’s Beauty Box? When you sign up to be a part of Macy’s monthly Beauty Box subscription program, each month you will receive five deluxe beauty samples, one bonus item, a collectible cosmetics bag and a $5 beauty coupon exclusively for Beauty Box subscribers, available for use online at Macys.com and in-store. How do I get the Macy’s Beauty Box? You must sign up to be put on the waiting list. Once a subscription spot opens up, you’ll be notified. How much does Macy’s Beauty Box cost? Macy’s Beauty Box only costs $15 per month. What comes inside the Macy’s Beauty Box? Every month is a surprise. But trust me, if it’s being curated by the beauty experts from Macy’s you know it’s going to be a great sample of the most popular products from your favorite names in beauty. Still not sold? Another feature I love about the Macy’s Beauty Box program specifically is that every month, Macy’s will post videos that will not only have specific info about the samples, but also how-to styling guides. Plus, with the $5 savings each month, it’s like you’re only paying $10 for the box and you’re getting the chance to sample what just might turn into your new favorite products in the comfort of your own home before you decide whether or not you want to purchase the full-size version. Have more questions? You can check out the Beauty Box FAQ page. But don’t wait too long, I wouldn’t want you to miss your spot! After all, it’s fun to be one of the first to experience a new trend.